Detached retina is a serious condition that can lead to blindness if it is not diagnosed and treated very quickly. It affects about one in 10,000 people. The retina is the innermost layer at the back of the eye that performs much the same function as the film in a camera. It contains millions of tiny light receptors that convert the visual image formed by the eye’s optical system into electrical impulses. These are then relayed along the optic nerve to the brain to complete the seeing process. In certain circumstances it’s possible that the retina can become detached from its underlying layer the choroid, which contains the many blood vessels that provide the retina with its nourishment. When this happens, vision in the affected region is lost. The retina may also become torn at the point of detachment. The situation can be exacerbated if fluids such as blood or vitreous fluid from the space in front of the retina penetrate beneath it. People sometimes fall into more than one of these groups, and in those cases the risk of retinal detachment is compounded. It’s important to remember that, individually at least, these symptoms can also be indicative other conditions, but the presence of anyone of them is good enough reason to contact a doctor or an optical professional without delay. Once the retina has become detached, it needs to be surgically repaired to restore or arrest loss of vision. If the detachment is partial a special type of laser treatment called photocoagulation can be used. 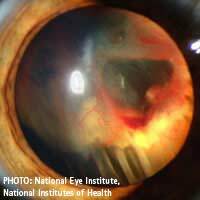 This treatment creates a scar around the edge of the retinal hole, fusing the retina to its underlying layer and preventing the entry of damaging fluids. An ophthalmologist (eye surgeon) may use another technique known as scleral buckling. This involves sewing one or more silicone bands to the outside of the eyeball, causing the wall of the eye to ‘buckle’ inwards and to bridge the retinal hole. In most cases the retina will then reattach, although there is usually an increased degree of short sightedness because the eyeball is lengthened by the procedure. Another method of repairing a retinal detachment is called pneumatic retinopexy. The perimeter of the retinal hole is fixed by freezing or by laser treatment. A bubble of gas is then injected into the eye and the position of the patient’s head is adjusted so that the bubble is resting against the hole. This is not the most practical of treatments because the patient has to keep the head in the same position for perhaps several days until the retina reattaches through natural processes! There’s really no way to prevent a retinal detachment, but regular visits to the optometrist will ensure that this and other eye problems are detected in the early stages, and have the best possible chance of successful treatment. People with diabetes, however, can minimise the possibility of detached retina caused by diabetic retinopathy through careful control of their blood sugar levels and by having eye checks through dilated pupils at least once a year. Finally, the correct eye protection should always be worn in hazardous environments!